As they say: hope for the best and prepare for the worst, and when your small business is concerned, the worst could potentially be a flood, fire, earthquake, or any manmade threats, such as hacks or thefts. A disaster recovery plan will help you recover from all this while also lessening any financial impact if your business is unable to maintain operations for a given period of time. An exhaustive plan is always the best option, but ensuring that your business has its most important bases covered will certainly be a great place to start. Take inventory of your software and hardware in order of priority. Additionally, be sure to include any support contact information from each of your vendors. Keeping this information handy will allow you to get back up and running as quickly as possible. Gauge acceptable downtime. Different businesses have different tolerances of downtime that they can handle. In other words, some can live without their technology much longer than others. For an example, for medical professionals, that downtime tolerance can only be minutes. Regardless of your business, divide hardware and software into three categories. The first is anything you need immediately. The second category will cover anything that needs to be back up and running within 24 hours. Lastly, the third category involves anything that can be recovered within a few days without much hassle. Set up roles and responsibilities. 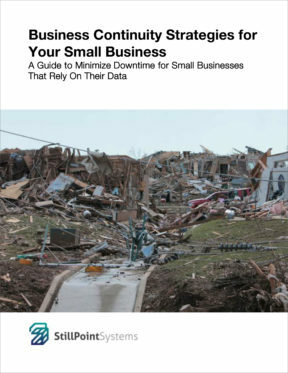 Disaster recovery will progress much more smoothly if everyone knows what they should be doing. To help further this goal, ensure that your plan has detailed the key roles, responsibilities, and parties. This will include third-party vendors and any providers. It will also be hugely beneficial if all parties are aware of the responsibilities of everyone else. Communication plan. If your staff relies on email or various other communication platforms to communicate, and a disaster strikes, then they may not be able to communicate, and your business needs to have a plan in place for how to circumvent this issue. In many disasters, email as well as phone service may both go down, and you’ll need to find an alternative way for your employees to communicate. This will ensure that communication lines stay open during the start of a disaster and through it. Have a backup location. If your primary worksite is no longer accessible, then it’s a great idea to have an alternative option in mind for where your staff can go to access systems. Provide a map so that your staff knows where to go and set up seating arrangements so that everything can run smoothly. If there are any compliance requirements, make sure your staff is aware of those as well. Ensure that your service-level agreements (SLAs) include disasters and emergencies. Outsourcing your technology to outside IT firms, or storing your servers in a data center/co-location facility may be a great way to maintain efficiency, but these situations pose their own set of challenges during a disaster. To help ensure that these providers begin resolving your problem sooner rather than later, have them sign a binding agreement that outlines their level of service during a disaster. Some of these agreements can also include how long it will take them to get your systems back up and running. Handling sensitive information. It’s critical to keep sensitive information protected, so outline any operational and technical procedures to help to ensure this goal. This will also include the maintenance (and access) of sensitive information when working under a disaster recovery plan. Regularly test the plan! The perfect plan will not be so perfect if it’s not regularly tested. There’s plenty that can cause a disaster recovery plan to simply fall apart once you begin to roll it out. A key person may have left the company, or the internet may be too slow to do anything. You may learn that one of your key persons is incapable of dealing with the issue. There are myriad things that could go wrong, so it’s important to test your plan, and test it regularly.